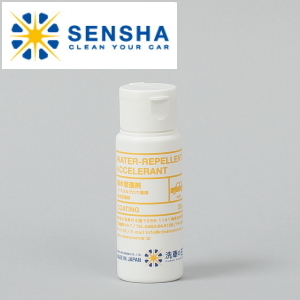 Water Repellent & Gloss additive to extend Crystal Coating Effect. This product is deployed after coating with Crystal Glow to give it an advanced performances. Crystal Glow is popular because of its transparent and glossy look of coating layer and this coating layer can be improved even more glossy and better water repellent effect with this product. Application is very simple and It can be use after Crystal Glow aplication finished the curing time as well as after several time washing or even after several months for coating maintenance. This product is deployed after coating with Crystal Glow to advance its performances. Crystal Glow is popular because of its clear-glass-like and gloss-like-wet coating layer and this coating layer can have even deeper gloss and better water repellency with this product. An application is very simple and It can be used although coating with Crystal Glow done after several months. An application is straightforward, apply Water Repellent Accelerant with a sponge and wipe off with a cloth. From beginners to professionals, everyone can use and get the same finishing. If you would like to apply this product to where coating with Crystal Glow was done several months before, please wash your car with car shampoo such as Body Clean and wipe off any remaining water completely. Please wash and clean surfaces properly before an application, otherwise it might cause scratches. Please do not apply this product to plastic and rubber. When applying the product with a polisher, please use a polishing pad for Water Repellent Accelerant only. Do not use the same polishing pad with other polishing compounds. Use Water Repellent Accelerant for coating surfaces with Crystal Glow only. We are always appreciated our customer reviews and suggestions. Water Repellent Accelerant is one of products we developed with our customers.